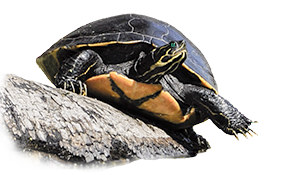 The Santa Fe River Turtle Project is a collaborative effort by scientists, students, and citizens to learn about the turtles inhabiting the Santa Fe River and to promote conservation of the entire Santa Fe River ecosystem in northern Florida. Since 2004, we have conducted a mark-recapture study of all turtle species throughout the river. Our capture methods include trapping with baited hoop nets and hand capture while snorkeling. To date we have captured, measured, marked, and released more than 7,000 turtles. The Santa Fe River and its associated spring habitats are home to 12 native turtle species and 4 non-native taxa. Few places on Earth have as many turtle species living together. In fact, 28% of all North American freshwater turtle species inhabit this small river system. Each species has a unique story of how it manages to live in the Santa Fe River. How do springs influence the behavior, morphology, demography, life history, and community structure of turtles in the Santa Fe River drainage? How do human activities affect turtle populations? How do turtles affect the river and springs ecosystems? How do the different species partition the habitat to coexist? Some springs are nurseries for Suwannee Cooters (Pseudemys concinna suwanniensis) and Snapping Turtles (Chelydra serpentina). Suwannee Alligator Snapping Turtles (Macrochelys suwanniensis) grow slowly (1-2 cm/year) and probably require 20 years to reach sexual maturity. Spring-influenced areas of the lower Santa Fe River have more than twice as many turtles as blackwater areas in the upper Santa Fe River. Between Rum Island and Ginnie Springs, there are approximately 4,000 turtles. Suwannee Cooters and Snapping Turtles eat the invasive plant Hydrilla verticillata. More than 200 Suwannee Cooters are severely damaged by boat propellers.